As most of you know, my appreciation of folding bikes began when I bought the Dahon Matrix in 2009. I still use that bike to this day: 26" wheels, easy enough to go on Metro North, durable enough to hook a trail-a-bike to, and dignified enough to ride in Manhattan in a suit and tie. But I've soured on Dahon since finding out the Matrix had been discontinued. There really wasn't another one like it and it was frankly irritating to be the owner of yet another 'orphaned' bicycle model. Now Dahon never said the words: "How can I make it up to you?" but they may as well have...because I've had the chance to ride this. 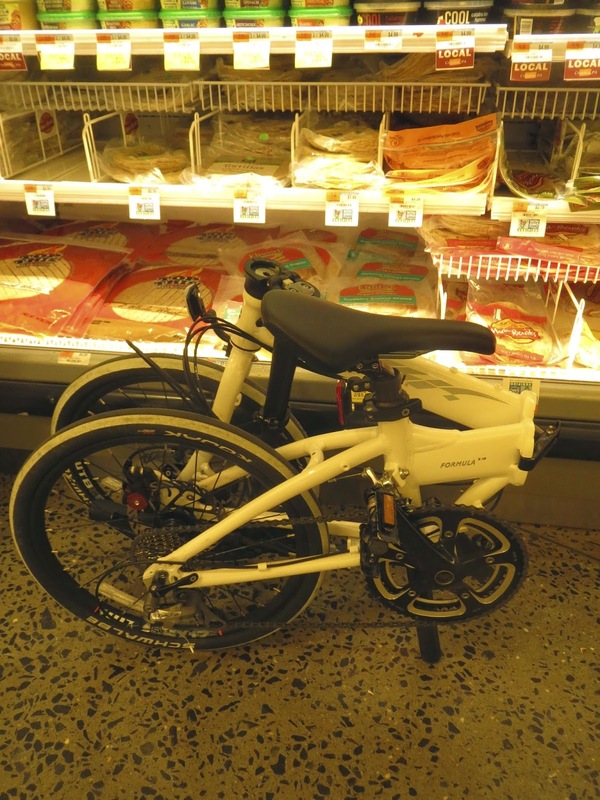 This is the Dahon Formula P18 lent to me by NYCeWheels. This bike doesn't have the same M.A.S.K. * vibe as the Matrix - because the Matrix doesn't look like a folding bike and this obviously does - but Dahon packed enough folding bike goodness in this thing to make it something special. For starters, you've got disc brakes. You never realize how massive disc brakes are until they're fitted on 20" wheels. You also never realize how powerful disc brakes are until you're on a little bike like this. I'm pretty sure if enough Dahon Formulas rode on the equator and they all stopped at once it would affect the tides. But if you're riding in a place where you'd want the ability to stop suddenly (like New York City) sensitive brakes are a nice feature. You also have plenty of speeds thanks to the 9 speed cassette in the back on the dinner plate-sized chainring in the front. The flat handlebar allows you to grip the bike like you mean it - but comfortably - while the push button shifters make you feel like you're on a mountain bike. But this bike isn't made for off-roading. What it seems to be built for is long-haul road rides - and I got to take it on a couple that were more than 20 miles each. This bike likes speed, and I found myself standing out of the saddle quite often to really feel the wind roar by. And unlike the Tern I reviewed earlier, which is a little on the large side, this bike actually becomes quite small when you fold it. However, the fold is different since you have to adjust the handlebar height so the bars can fit between the wheels on the fold - and not interfere with the magnetic clasp. That also means that each time you unfold the bike you have to take a few moments to bring the bars back to the preferred position. But on the plus side: when it is folded, one can bring it into a coffee shop without seeming to bother anyone. I also carried the bike into Whole Foods just to see if anyone would try to stop me. Nobody did, but that may have been because I smelled pretty bad at the time (it was a very hot day) and store managers may have just wanted to avoid my Pig-Pen cloud. And carrying it a long distance - to the dairy aisle and back - reminded me how pleasantly light it is. So I still miss the bigger, heavier, slower, cheaper but stealthier Dahon Matrix, but I do have to give credit where it is due for the Formula (available, of course, at NYCeWheels). Having to adjust the handlebars to get it to fold (and the fact one should carry a mini tool with them at all times in case a hinge needs an adjustment) isn't a deal breaker: if you want a pedal-powered rocket sled, the Dahon Formula P18 will not disappoint. *If you had to look at this, you probably didn't grow up watching cartoons in the 1980s. You also probably don't know that V.E.N.O.M. stands for Vicious Evil Network Of Mayhem.